​Dr. Alvaro Angulo, affectionately known as "Dr. A. ", earned a Bachelor’s Degree from the National Conservatory in Colombia, South America. He also holds a Master’s and Doctorate degrees in music performance from Louisiana State University. 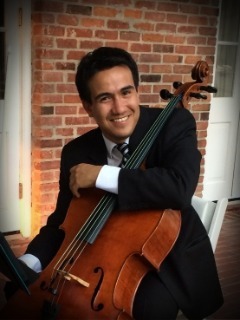 His experience as a Cello performer includes recordings with orchestras conducted by the conductors of Berlin Philharmonic, Houston Symphony, Los Angeles Philharmonic, Louisiana Philharmonic, Guayaquil Symphony, and Simon Bolivar Symphony Orchestras. A versatile artist, Dr. A. has developed several professional roles as a private instructor, strings conductor and music producer. Dr. Angulo is passionate about educating multicultural groups and to experience the power of music. He strongly believes that music offers the perfect conditions for students to put into practice important qualities and values such as responsibility and respect. Pursuing musical excellence, his goal is “to empower his students to bring out their best, not only at playing their instruments but in all aspects of life, to help them blossom into well-rounded individuals".